We have received two fantastic awards – The Dogzonline 2018 Advance Breeder of the year for kelpies, and amazingly – the Dogzonline 2018 Advance Breeder of the Year for working dogs. We also came 4th across all breeds of dog nationally. That means we were the best breeder of kelpies nationally, the best breeder of any working dog breed nationally and the 4th best breeder of all breeds nationally. 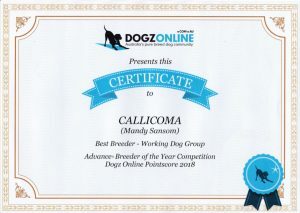 This is a pointscore, and any time any dog bred by Callicoma gains any title, or has any show wins, they contribute to the award. 23 Callicomas contributed in 2018, across many disciplines – Showing, Obedience, Agility, Rally O, Herding, Dances With Dogs and Endurance. Thanks to everyone that put in all the work to train and compete with your Callicomas.